Guests who love the idea of outdoor living will feel right at home at Petit Saint Louis Villa. The main living area on the covered terrace has comfortable furniture for enjoying the harbor view and breeze. If you want to lounge by the water, you have access to Corossol Beach down below. Petit Saint Louis is a nice Caribbean-style chalet situated on the hillside of Corossol, with stunning harbor and sunset views. This one-bedroom residence is minutes from the beach, and can be rented with its sister villa, Habitation Saint Louis. The suite opens to the terrace, which has a swimming pool, dining table, and Indonesian-style lounging furniture. There’s a small kitchen off the terrace that’s fully equipped with an electric oven/stove, microwave, dishwasher, fridge, freezer, ice maker, toaster, coffee maker and blender. Inside, guests can relax into the king-sized bed and watch DVDs and satellite TV. The ensuite bathroom has a shower, dual vanity, and a safe. The entire interior is air-conditioned for guests’ comfort. Petit Saint Louis can be rented with its sister villa, Habitation Saint Louis, for an additional four bedrooms. In the Holiday Season, Petit Saint Louis is rented at full capacity. 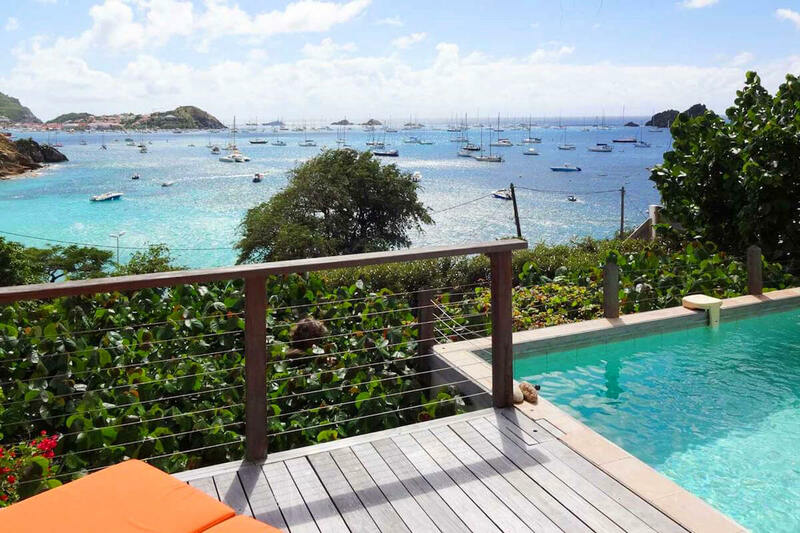 This villa has an ideal location, as Gustavia’s restaurants and activities are only 2 minutes away and the airport is 5 minutes away. This villa was beautiful! Everything we thought and more. The pictures do not do the natural beauty justice. Will be back! Shawna was great, very timely responses. Very easy to work with. Our stay at Petit St. Louis was amazing. The villa could not have been more perfect and the villa management could not have been better. We even chose to stay an extra day and the managers Eric and Emillie took care of rebooking everything including our rental car for the extra day. The private beach access was one of the best parts and was amazing for snorkeling, we swam with sea turtles and an octopus right in our own backyard! There is not one thing I would change about the villa, for us it was literally perfect. i would, in a heartbeat, use shawna and wheretostay again. We booked our honeymoon last minute ( 5 days prior to leaving) and she made sure we had everything we needed. When we arrived the villa manager and our car rental were waiting for us at the ferry. I never had to call or ask for anything, I told her what we wanted and she delivered! She even sent is the ferry information, times and recommendations so we did not have to spend time trying to figure our what to do or where to go.